← What a Month! Please read on for important updates . . .
Last month I reported that Ken Skates, the minister for infrastructure and the economy, had issued a shortlist of a dozen proposed new stations that would be given priority for taking forward for ‘stage 2 assessment’ (to look at their financial, economic and deliverability). Magor and Undy WAS NOT ON THAT LIST! I said that we would seek clarification from Welsh Government by all means at our disposal. We did just that . 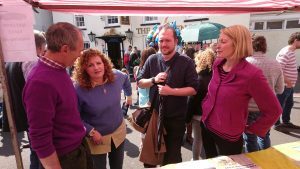 . .
On May 1st, Jessica Morden (then our MP) and John Griffiths AM were at the May Fayre visiting our stall so we took the opportunity to raise the issue with them and they promised to make some urgent enquiries. We also followed up with Assembly Member, David Rowlands, a keen supporter and friend of our group, who agreed to look into the matter. Within hours we had an assurance that Magor and Undy was still ‘in the process’ and that the Minister, Ken Skates, would meet with us to discuss. On the evening of May 3rd, Ken Skates met with Ted Hand and myself along with Jessica Morden, John Griffiths and Councillor Frances Taylor in the Golden Lion function room. We had a really good discussion with him, emphasising the progress made and the uniqueness of the ‘Walkway’ concept and being linked to a ‘community hub’. He confirmed that ‘Magor’ was still in the process, had scored well against the benefit cost ratio and would be taken forward once the 12 identified had been assessed (i.e. caught up with the status of the Magor and Undy proposal). We reminded him that we were about 1/3 of the way through GRIP 3 and Monmouthshire County Council (MCC) were asking Welsh Government if it could help fund the remaining phases of GRIP 3. He confirmed that his people would continue to work with MCC on that matter. We thanked the minister for taking the time and trouble to meet us and thanked him for his reassurance. On May 4th, I wrote (click here) to the minister to thank him and ask him to confirm the main points of the meeting. We received his reply on 12th May which confirmed the points he made. Having now received the reassurance from the minister, we discussed our aims and objectives for the 2017/18 year. Our annual plan will be published on this website in the next week or so. This year our main points of focus will be on completing GRIP 3 to stay ahead of the game, communicating the concept of the Walkway station and in particular what it will mean for Magor and Undy people and also building a working/project relationship with the MUCH Group and MCC in developing the Three Fields Site and Community Centre. MCC are pursuing the acquisition of the small piece of land next to the 3 Field Site (which was recently put up for sale) as an asset to support the development of the 3 Field Site and the Magor and Undy Walkway Station (as it had been identified as a vehicle ‘drop off’, disabled parking area and turning point in the GRIP 2 study). Quite a long ‘post’ this month but hopefully an informative report!